Now, two obstacles to this. A) I'm going to have to move things between the three files. Assuming this is OK, is there a max file size I need to stay under? B) While most of the .evs files seem very specific, a handful of them are a giant mess. There's one that randomly includes bridge chatter AND post-battle report voice-overs. bs999.evs is a humongous run-on nightmare that seemingly includes most of the special battle events; it even has dialogue for the Tabris fight, even though there's a separate tabris.har that segregates stuff from the same event. Being able to split apart these problem .evs would be a big help, but I have no idea if it would cause problems down the road or not. Absolutely no objections to waiting on IMTEXT. Reichu wrote: A) I'm going to have to move things between the three files. Assuming this is OK, is there a max file size I need to stay under? Yes you can move things between the three files. Regarding the file size, Github's online editor only works for files < 1 MB. And because the files will eventually get English text, we can expect them to grow 2x their Japanese only size (rough estimate), meaning the Japanese only file should be < 512 Kilobytes at least. Reichu wrote: B) While most of the .evs files seem very specific, a handful of them are a giant mess. There's one that randomly includes bridge chatter AND post-battle report voice-overs. bs999.evs is a humongous run-on nightmare that seemingly includes most of the special battle events; it even has dialogue for the Tabris fight, even though there's a separate tabris.har that segregates stuff from the same event. Being able to split apart these problem .evs would be a big help, but I have no idea if it would cause problems down the road or not. Definitely not as long as the Japanese within the "" stays the same in the move. Reichu wrote: Absolutely no objections to waiting on IMTEXT. For today what I ended up doing is working on hgpt.py, responsible for exporting and (todo) importing images into NGE2's format. 1 - Modified hgpt.py to export PNG images via PurePNG (a publicly supported Python library, which I've added into the project for ease-of-use). 2 - Tried to get hgpt.py to export images from the PS2 version of the game. Got close, but I couldn't figure out the tile format. It's like 32x32 pixel blocks, with sub-blocks within them. The progress here complicated the PSP code, so I removed it. Maybe it'll come back as a separate spin-off converter one day. Error: Unknown pp version: 8800! I've uploaded my changes as hgpt_new.py on GitHub, still WIP and incomplete hence why I didn't overwrite hgpt.py with my changes. So here's IMText with the 3 unknown numbers per line which we were talking about earlier. WARNING: The file is 30 MB, but has a lot of duplication. The first column is more often than not unique within a group of duplicates, while the second and third columns repeat. My response got so huge that I'll post it in two parts. The rest will follow today or tomorrow. In the evs, you'll see 第$d使徒 (the $d Angel) pop up now and again. $d just fills in a plain integer, I believe. Now, since the kanji 第 makes the integer that follows it an ordinal, this all works out fine... in Japanese. But in translation, we have a problem. If we put "the $dth Angel" (which cooperates with numbers 4 through 17), a number 3 getting slotted in there will produce "the 3th Angel". How to get around this? There are various instances in the game where one character is asked what they think about another. The responses are all generic in Japanese, and naturally have no pronouns whatsoever. This means, for us, using "they" in translation so the generic element is maintained. "I like them alright", "They're very special to me", "I hate their guts", etc. I wanted to bring this up in the event there was some way to get around it, since the pronoun evasion is, if nothing else, highly distracting. Item C brings up additional issues as well. This is for an interaction feature added to the PSP version, where characters can share or ruminate upon PREVIOUSLY OCCURING character interactions. So, like, if you gave Rei a present in the morning, you can tell Pen Pen about it in the evening, if you want. You can probably guess just by looking at it that it's text only (not spoken) and pieced together on a case by case basis from a long list of sentence fragments provided elsewhere in rodata. This makes translation a problem. I'll illustrate with a couple of examples. Here's the template in a more detailed form. To make discussing this more meaningful, I'll provide a couple of actual examples from the game of it being used. 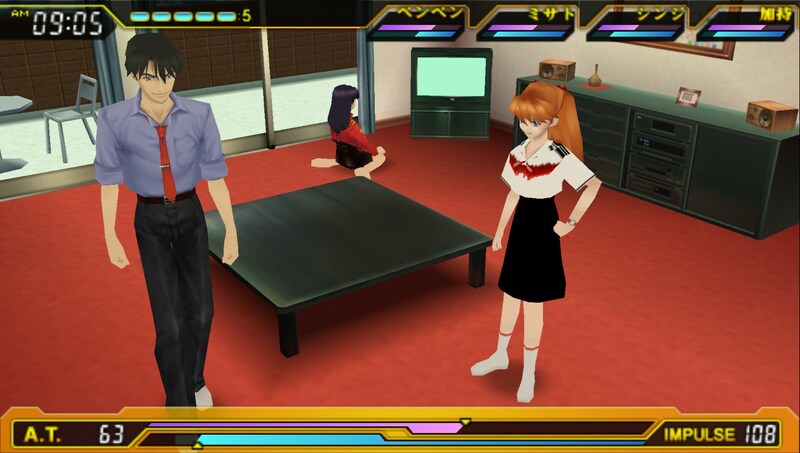 Shinji remembered something that happened half a year ago: PenPen joyously receiving a present from Asuka in the apartment living room. Shinji told Kensuke something that happened two hours ago: Hikari responding to a greeting from him right here. Now, the mix and match approach here makes translating the individual pieces a total nightmare, since you HAVE to know how they're being used in context to render them properly, and, boy, looking at the list in rodata, there are a LOT that I have yet to see in action. So more thorough documentation of in-game use is one order of business to take care of. Shinji Kensuke, two hours ago something that happened told: right here Hikari him a greeting from responding to. I have my fingers crossed that a single rearrangement of the original elements will be able to handle all necessary English translation -- but I need to collect more examples before I can feel assured about this. %s(1) and $s(5) are sometimes left blank. Perhaps you can explain this one... Notice how there are some particles right there in the template, yeah? は and を for instance. Now, if %s(1) or %s(5) get filled in, a particle (が or に) appears after each of the names, respectively. I would assume the actual NPC name to get drawn from one of the standardized lists in rodata, like the one at 0x001BB720 to 0x001BB7A0. But if that's so, where is the game being told to follow the name with a が or に? Guess I would have expected something like this to show up in the files you've provided and I've seen no indication of it. Understanding this might be required for getting the translation to render properly, I assume? Otherwise we might have random Japanese particles popping up amidst the English. So I was trying to translate some of the character interaction items in rodata when it occurred to me that something rather funny was afoot. Two other "actor"-type terms appear here, 能動者 (active participant) and 乱入者 (intruding participant). Curiously, these don't -- unlike 受動者 -- seem to appear in the names of selectable options, and they don't show up in imtext either... so I wonder how the game is using them? Hmmm. "$c muscled into your liaison!" Another interruption. "$c was treated like a nuisance..."
So $c probably is being used consistently to mark 乱入者, the "intruder" -- someone who isn't wanted in an interaction. I'm going to take a guess now that $a is 能動者 (active participant) and $b is 受動者 (passive participant). (0x00000002, 0x00000000, 0x00000000, "$aは$bに、\n$oのプリントを差し出した。\n\0\0"), $a presented a print-out of $o to $b. 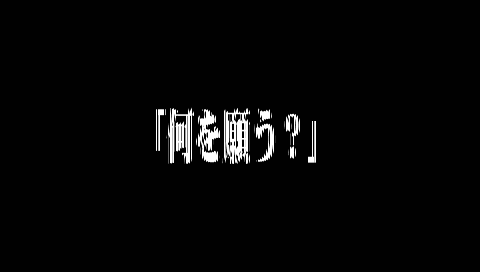 (0x00000003, 0x00000000, 0x00000000, "$bと$aは、\n面白おかしく\n話をしながら登校した。\n\0"), $a went to school with $b, having an interesting talk on the way. (0x00000002, 0x00000000, 0x00000000, "$aの$oと\n$bの$pを\n交換した。\n\0\0\0"), $a exchanged their $o with $b's $p. (0x00000002, 0x00000000, 0x00000000, "$aは$bに\n$oを渡した。\n\0\0"), $a gave $o to $b. (0x00000001, 0x00000000, 0x00000000, "$aは$bを\n好意的な目で見た。\n\0\0\0\0"), $a looked at $b with friendly eyes. Another "no dialogue box" instance is during the best ending for Scenario 1 (here, around 5m22s). The screen goes black and we get voiceover only of the Yui/Gendo "anywhere can be paradise" scene. As usual, the game has this all written out in its files (here, in tev1905.evs). You wondered here if it might be possible to unhide the dialogue box. Accomplishing this in some way might get increasingly important; I anticipate that more of these instances will appear to haunt us. deeRez wrote: Does your PSP have CFW? SSD actually sent me instructions for installing Pro CFW the other day. I'll see if I can get it working and get back to you on this. Figuring that out would be interesting and ties with SSD's earlier request to try to activate the missing scenario. 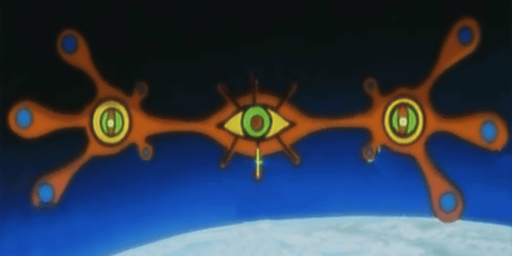 Now that my memory has been jostled a bit, I recall that the "three Shinjis" ending was, in the PS2 version, the ending Gendo got if Rei rejected him. She can still reject him in the PSP version, so presumably that would make the "three Shinjis" ending occur. This list, for instance, makes no mention of an omitted ending in enumerating the PS2/PSP versions. The data is all this there, and the circumstances for triggering it still exist, so it seems very odd that it wouldn't be triggerable. Like, what happens instead? Very curious... I might have a half-finished Gendo game I can fire up to resolve this issue. Reichu wrote: But in translation, we have a problem. If we put "the $dth Angel" (which cooperates with numbers 4 through 17), a number 3 getting slotted in there will produce "the 3th Angel". How to get around this? I guess it would depend on context, but "Angel %d", "Angel #%d" or "Angel number %d" should work in some instances. the pronoun evasion is, if nothing else, highly distracting. It could be suggested, though, that this usage is gaining currency quite strongly these days, so the distraction should not be too long-lived. Your later examples show the problem more severely, though. Reichu#875590 wrote: Item A) Angel ordinals. Yeah this is difficult. Reminds me of that Eva PSP game called 3nd Impact. I do find the ordinal framing important. For now go with $dth. We can revisit this later, by trying to add a new letter to their $ system that would return the number + appropriate ordinal suffix. but they're too rough on the edges at the moment - utilizing phonemes rough on the English tongue. the effort required would be hefty. The "%s %s %s" stuff has a second part located in code that specifies what the parameters are. If you can figure out the most optimal order, then I can make it happen by modifying the code. "But if that's so, where is the game being told to follow the name with a が or に?" The code I assume is modifying the name, storing it in a temporary place, then plugging that temporary into the sentence. Sooooo, turns out the が character is located at 0x001D1364, which is in memory right before the sentence we're discussing. I've omitted it from rodata_translate since I wasn't sure if it was a Japanese character or a value that coincidentally looked like a Japanese character (given how short it is). I'll need to update rodata_translate (and the regular rodata) to inject them into their proper places! but they carry certain connotations. How about oneself? first I want to smack ArcSystems for having like 3 different text replacements systems now. %s, $a, and now replacing phrases? Replace all occurrences of 受動者 with PsvChr - something short (six characters) in Roman that's not an English word. The others can be ActChr and IntChr. My rationale for this is so that it's at least still translated, but programmatic-looking-enough so as to not conflict with other English words. Six characters ideally because the original takes 6 bytes of memory. Yeah looks like this raises the priority of trying to display the dialog box. I'll definitely take a look! It might be as simple as flicking a bit somewhere in one of those unknown numbers. deeRez wrote: For today what I ended up doing is working on hgpt.py, responsible for exporting and (todo) importing images into NGE2's format. Nice work, deeRez. Looking forward to an updated image pack! Might be able to run those through my Japanese OCR when translation time comes (makes kanji look-up easier, heh). Re:IMTEXT - Thanks for providing the full thing! Aaaand... it looks like we're in business! Digits 5 and 6 from the first parameter give us our speaker! I should be able to identify most of the classes. Give me the word and I'll get on it. Does the game have cutscenes that happen while the player is standing still? I do know there's the angel appearance one that happens when the clock runs out but I don't want to hijack that one cause if there are events that happen randomly, I rather tweak the randomness. The cutscenes I've witnessed so far are all after I selected something in the world-map menu. The range 0x001D1438 to 0x001D3DAC looks to me like a plethora of hidden programming stuff (for... lack of technical term). 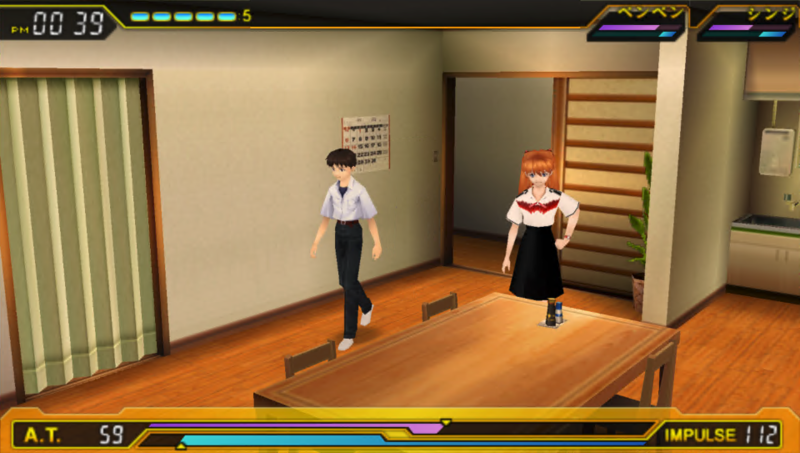 Many of the bulleted items pertain to enticing-sounding menus, like "Hideaki Anno Mode Settings" and "Event Test Menu". Around 0x001D4630, there's a bunch of what look like... event switches? 0x001D6540 to 0x001D65BC specifically look like they refer to the different "Anno" modes that you need to trigger to make different event types occur. On the topic of figuring out what all this stuff is, should we continue to refine the rodata notes file? Have it on hand as documentation? There's still a lot I haven't added... I suspect you may be able to add some insight into identifying what the various programming-related items are, especially now that a lot of them have translations. (a) Shinji told Kensuke something that happened two hours ago: Hikari responding to a greeting from them right here. (b) Shinji told Kensuke something that happened two hours ago: Hikari responding to a greeting from Shinji right here. The second is much clearer, so is probably preferable, right? pwhodges wrote: I guess it would depend on context, but "Angel %d", "Angel #%d" or "Angel number %d" should work in some instances. A viable and maybe less distracting alternative, if programming it to account for "3rd" vs. "4th ~ 17th" is too difficult, might be to simply omit the ordinal from the translation altogether. The tactical battle dialogue does sometimes just say "Angel", and specifying WHICH Angel is the exception. The ordinals aren't part of the voice clips, either -- they're just amended to the text window -- so no one would notice anything was missing. 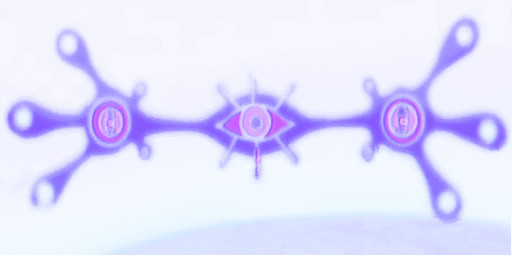 (A) Special symbols in the translation? Is it okay to use emdashes, ellipses, etc.? (B) Drawing emphasis to a particular word. All caps is an option, but this can sometimes be unclear. An option I've seen in use is to frame with hyphens -like this-. Does me doing this mess up your side of things too much? Just want to make sure. Haven't modded my PSP yet, so I think that's all for now. Reichu wrote: Re:IMTEXT - Thanks for providing the full thing! Aaaand... it looks like we're in business! Digits 5 and 6 from the first parameter give us our speaker! Cool! I'll get to regenerating the imtext parts with the added speaker information! Reichu wrote: Far as I can tell at the moment, the groupings in the full imtext file itself correspond to the individual dialogue classes. Lines 31822 to 35549 are Labyrinth of the Heart, for instance. Adding both the speaker and a short description of the dialogue class would probably make the five-part imtext less intimidating. Sounds like a great idea, but hold off on carrying it out right now since we're holding IMTEXT off for the masses. (I'm adding decisions written here to my notes, which I plan to reassemble into guidelines when we prepare IMTEXT for the masses; by just making the guideline about IMTEXT, it simplifies the stuff new folks have to learn). Also, for the masses we need a way for them to test, and yes, I began laying down the foundation code for this, last weekend. I'm using a solution that the Hatsune Miku translation team used, but with changes for Another Cases. With data 100% done, and rodata 50%, I think it'd be best to pause work on EVS and focus on finishing off rodata. The reason is that data / rodata, unlike the translations of game files, will need to be moved around in code to fit longer translations. For every line that can't fit in the original place due to being too long, I have to manually find the place in code where the line is used to be able to move it. I'm also slightly worried my decision regarding skipping compression when reinjecting the files might come to bite us, because the PSP only has so little RAM. I'll probably revisit this and try to write a compressor. Reichu wrote: The range 0x001D1438 to 0x001D3DAC looks to me like a plethora of hidden programming stuff (for... lack of technical term). 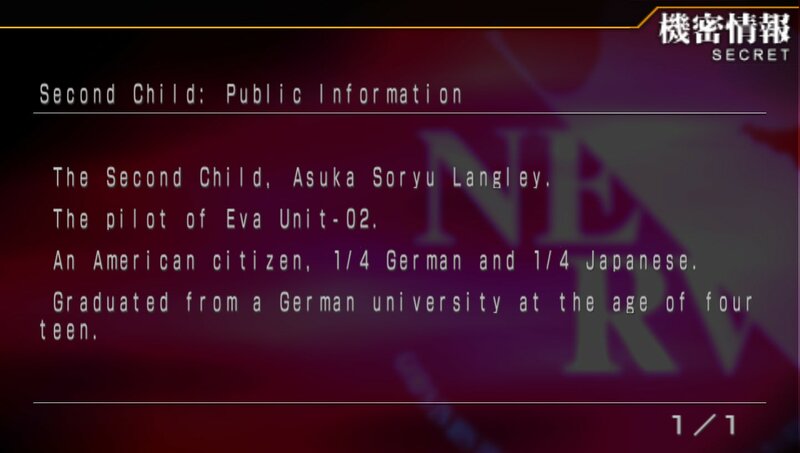 Many of the bulleted items pertain to enticing-sounding menus, like "Hideaki Anno Mode Settings" and "Event Test Menu". Around 0x001D4630, there's a bunch of what look like... event switches? 0x001D6540 to 0x001D65BC specifically look like they refer to the different "Anno" modes that you need to trigger to make different event types occur. Yeah I barely scratched the surface. There seems to be a lot of hidden menus that I couldn't get access to the last time I looked. I definitely plan to try again sometime after most of my plate is cleared. Reichu wrote: On the topic of figuring out what all this stuff is, should we continue to refine the rodata notes file? Have it on hand as documentation? There's still a lot I haven't added... I suspect you may be able to add some insight into identifying what the various programming-related items are, especially now that a lot of them have translations. I could definitely take a look and refine the programming sections! Reichu wrote: Possible workaround for jibun and its related pronoun issues: what if we replaced jibun with the code to insert the player character's name? and slowly branching out other cases as we test them. I assume $a will only work in things that show up in the message box. Reichu wrote: A viable and maybe less distracting alternative, if programming it to account for "3rd" vs. "4th ~ 17th" is too difficult, might be to simply omit the ordinal from the translation altogether. The tactical battle dialogue does sometimes just say "Angel", and specifying WHICH Angel is the exception. The ordinals aren't part of the voice clips, either -- they're just amended to the text window -- so no one would notice anything was missing. A - I'd suggest using -- for emdashes and ... for ellipses, thereby keeping the input ASCII only. I'll then convert them to the proper character. B - What does the game use for this? The Japanese brackets? Yeah it'll mess with completion percentages, but it's fine. Reichu wrote: Haven't modded my PSP yet, so I think that's all for now. Feel free to PM me if you run into any issues. Hm, would the Anno Mode have something to do with the "Anno AI" implemented into the PS2 (and assumingly PSP) version(s)? deeRez wrote: B - What does the game use for this? The Japanese brackets? Spring break! Finally some respite from the constant tests! I'll try to blast through as much of the rodata as I can this week. Sorry for my extensive absence. Welcome back, Kira! Are you caught up on the thread? A lot of things have been discussed while you were away. deeRez wrote: With data 100% done, and rodata 50%, I think it'd be best to pause work on EVS and focus on finishing off rodata. 78177 'Raise a topic\0', "話題をふる\0"
105137 'Request your allowance\0', "小遣いを要求する\0"
105141 'Hand over allowance\0', "小遣いを渡す\0"
105146 'No money to give\0', "お金が無くて渡せない\0"
120921 'Let it go to your head\0', "いい気になる\0"
125053 'Watch who\'s sleeping\0', "寝ているのを見る\0"
125717 'Drink juice\0', "ジュースを飲む\0" + 'Drink beer\0', "ビールを飲む\0"
125741 'Vent on the wall\0', "壁に八つ当たり\0"
The numbers correspond to the line in imtext. 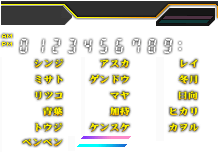 The text following a number is the command that, in-game, produces the dialogue and description listed in imtext. (...) indicates a range I haven't filled in yet. Is this format alright? Would something else be easier for you to work with? Ah, right, forgot about that. I guess in that case, greater priority should be given to compressing translations? Or should we not worry about that just yet? The brackets draw emphasis in a "key word (pay attention!)" kind of way, which isn't the only possible way. Sometimes emphasis is just implicit in the use of language. @Kira BB Yamato: What would probably be a good idea, when we're both working on the same file at the same time, is for each of us to claim a specific range as our own. That way, no work is wasted. Then we just post in-thread when we're unavailable, freeing the claimed range back up again. What do you think? @deeRez: It occurs to me that at least some translation of the evs will be necessary for rodata. Specifically: rodata has the player commands for the Leliel and Tabris "battles" (which you basically talk your way out of), while the evs has the actual dialogue. Without the dialogue, it's not entirely obvious how to translate the commands. Reichu wrote: Is this format alright? Would something else be easier for you to work with? Reichu wrote: Ah, right, forgot about that. I guess in that case, greater priority should be given to compressing translations? Or should we not worry about that just yet? Do not worry about it just yet! Reichu wrote: The brackets draw emphasis in a "key word (pay attention!)" kind of way, which isn't the only possible way. Sometimes emphasis is just implicit in the use of language. or maybe Titular case. What do official translations do in this case? Keep it! I’m on the verge of creating a new plugin. Cwcheat is not worth installing. Reichu wrote: @deeRez: It occurs to me that at least some translation of the evs will be necessary for rodata. Specifically: rodata has the player commands for the Leliel and Tabris "battles" (which you basically talk your way out of), while the evs has the actual dialogue. Without the dialogue, it's not entirely obvious how to translate the commands. In that case, do translate the EVS for those portions! Reichu wrote: Welcome back, Kira! Are you caught up on the thread? A lot of things have been discussed while you were away. Yeah, I'm always keeping an eye out. It was this way with the G Gen Overworld translation too. I fade away for a time when the semester heats up, then I return and try to fire through as much as I can. Doesn't sound bad - though I tend to either pick randomly or try to fill in any gaps I see. So I don't really claim anything. @General: I'm not completely satisfied with the format for the notes files. They feel a bit haphazard and ugly; I'm just kind of making it up as I go along. Is there any kind of standard I should be aspiring toward? A usual way of doing these things? Kira BB Yamato wrote: Doesn't sound bad - though I tend to either pick randomly or try to fill in any gaps I see. So I don't really claim anything. I'm kind of the same way. But if we're both working on the same file at the same time, doesn't it make sense to avoid redundancy? It just seems like a good policy to me -- know what the other person is working on, so you can put your focus somewhere else. Makes thing more fair for both of us. Meantime, I suppose I'll focus on the Tabris and Leliel battle stuff (the ranges are provided in the rodata_translate.notes), along with the mess of sentence fragments from 0x001CC12C to 0x001D1274. Official translations nowadays have more formatting liberties, I believe? You can incorporate things like bold and italics into subtitles. I'll have to keep an eye open, though. Some stuff's been happening IRL and I haven't gotten too much done the past couple of weeks. Seems like the rest of you have been busy as well, so no real issue, I suppose. Meantime, I have grabbed some Japanese grammars plus a handbook on the Kansai dialect (*shakes fist at Toji*) and I'll keep trying to brush up here and there. Whenever the project rouses a bit again, I won't be too far away. Reichu wrote: Some stuff's been happening IRL and I haven't gotten too much done the past couple of weeks. Seems like the rest of you have been busy as well, so no real issue, I suppose. Meantime, I have grabbed some Japanese grammars plus a handbook on the Kansai dialect (*shakes fist at Toji*) and I'll keep trying to brush up here and there. Whenever the project rouses a bit again, I won't be too far away. Don't worry! I don't expect this project to be completed in less than a year anyhow, and you folks have made tremendous progress within the first three months. I've taken a look at the programmer-text ranges in the notes you've made, and there was nothing I could add that might help figure out what those sections are. They're all some kind of debug menu. Regarding the standard in the notes, what you have is fine. You're going to meet Fresno, the "cook of all cooks"
with the ability to repack as well. but ffmpeg can convert them to .mp3. There might be some interesting unused sounds to find if someone wants to take a look. EDIT: Currently I'm taking another look at the decompression routines in NGE2. I never ended up documenting the compression method properly, because I ended up writing a stripped-down PSP emu in Python and having it run the game's exact decompression code and calling it a day, but that means we have zero ability to compress stuff. If we want to modify images, we're going to need to compress them due to the PSP's memory limits. I'm bored to tears having to tackle compression, but going to bite the bullet and plow through. instead of having a PSP-Python emu run it. A 70Kb file would take about 46 seconds to decompress before. Now it takes 6 seconds. Since Python doesn't support gotos nor variable gotos, I ended up doing a slight hack to simulate labels/gotos using a while loop, a bunch of ifs, and continues. I wrote some bootstrapping code to do the conversion instead of doing it manually. I plan to start modifying the pieces of logic in zipped.py some more to simplify it in order to be able to write a decompressor. 2 - More progress made on converting pictures to NGE2's format. so just a heads up. I started tackling the f2tuto.bin/f2info.bin/btimtext.bin/imtext.bin files and have gotten far in writing an importer script. Above you can see the C.I. information has been correctly imported.